One of my biggest vices is to enjoy the weekend watching classic movies, I sit on the sofa with a drink and popcorn. 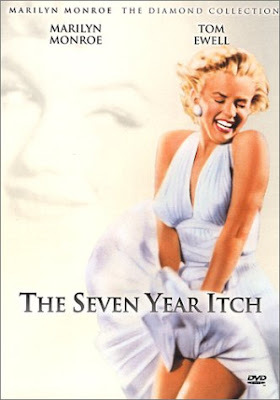 Last Saturday I saw The Seven Year Itch. 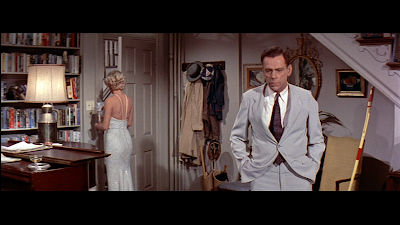 Of course the most representative of this film is the white dress that Marilyn did famous on this scene. But that's not my style ... so I liked the lower back of the dress she wears in this another scene in the photo below, with this idea I drew something that better suited the way I wear, with this beautiful red fabric I thought make a dress that was well adjusted ahead and behind whit wheel, with a turtleneck and short sleeves. With my bills I made patterns did for begin to cut the fabric, though I don´t like clothes too narrow with this model I think I will adjust a bit my figure from the waist and give more width to the hips, so I'll get disguise a bit my wider waist. Here are two photos of the first test of the dress front and back, was perfect and there was no adjustment to do since this employer with my measurements. Now, I´m gonna cut the sleeves and the neck, I will use a straight strip cut on the bias for the formation. Tomorrow I hope to sew the sleeves and finish to put photos. The friday night, when I went off the job, I found a surprise, my husband was waiting me with a present. On the street where is placed my job, there is a jewelry shop and a few time ago I saw those earrings and I fall in love with them. 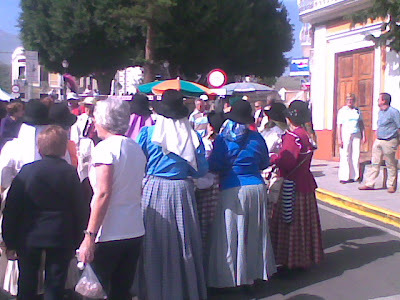 On Sunday morning there was a fair in a nearby town and my husband and me went for a walk, was fun and most people were dressed in clothing typical of the place, here is widely used in clothing and holiday villages, I also have my typical dress but show some other time. 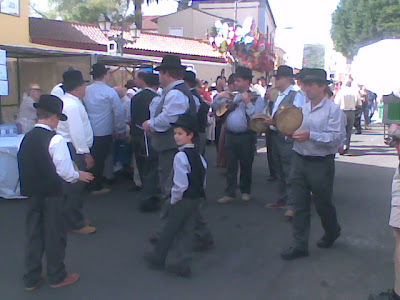 In the picture above, a group of men and the lower a group of women dressed for the occasion. 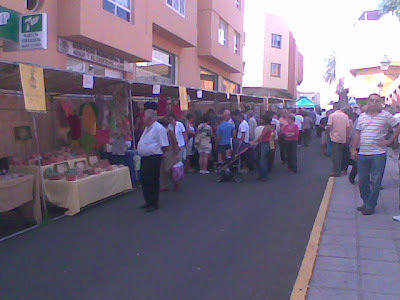 At the show, artisans booths placed in the streets and selling their products to visitors, all that is sold is handmade and there are all sorts of things from food to all kinds of crafts. 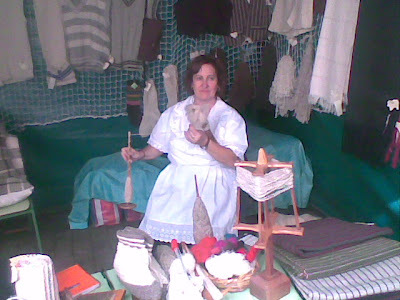 .I asked permission to a woman who was spinning wool, this wool is used to weave or make cloths. 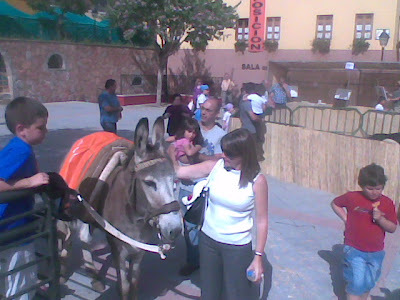 I could not resist my picture with a donkey is an animal in danger of extinction, it was a fun Sunday ?